Sunspots are places in the sun's atmosphere that are much cooler. The photosphere is the visible layer of a star, most often brought up in discussions about the Sun. Though the Sun may appear to have a solid outer layer, just like the Earth, in truth it is made up of immensely hot gasses and has no solid surface. The photosphere marks the boundary where light can penetrate the gasses, allowing it to become less opaque and, thus, visible. What a person sees when he looks at the Sun is the photosphere. The density of the atmospheric layer is not consistent in all places at all times, but tends to be about 248.5-310.6 miles (400-500 km) thick. The temperature ranges between 5,000 and 6,000 degrees Kelvin, or about 8,540-10,340 degrees Fahrenheit. It is the lowest layer of the Sun's atmosphere, sitting below the much thicker chromosphere and the enormous corona. Below the photosphere lie the Sun's convection and radiation zones, and beneath that, the mighty core. When looking at the photosphere from far away, it may appear to be a simple yellow or orange disk with a few dark spots, known as sunspots. Up close, however, the photosphere has a textured appearance often referred to as granulated. While not necessarily pretty to look at, the bubbling texture of the photosphere is evidence of exactly how the sun works: the bubbles and knobs are signs of the process of convection. Convection on the sun works essentially the same way a boiling pot of water does; heated photons rise to the surface while cooler ones sink, except instead of a bubbling surface on a pot of boiling water, the convection of the sun produces the granulation in the photosphere. Sunspots, the dark blotches often seen in pictures of the sun, are patches of the atmosphere where it is noticeably cooler, sometimes by more than 1,000 Kelvin (1340 F). 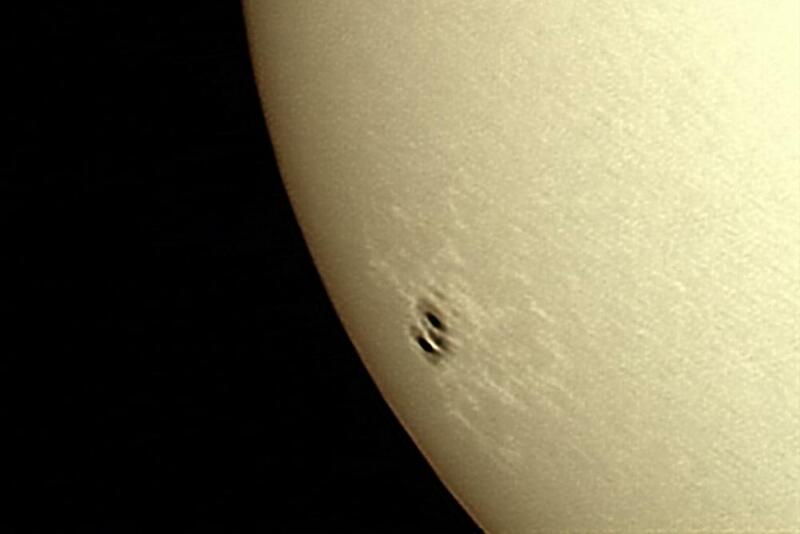 Sunspots are not constant features and tend to rise and fall away within a few weeks. Despite their comparatively chilly temperatures, these spots have been shown to be exceptionally strong magnetic forces. Though they often look tiny, sunspots in the photosphere are often tens of thousands of miles across. Interestingly, observing the photosphere led to the discovery of one of the most abundant elements in the universe: helium. Though credit is given variously to the English scientist Norman Lockyer and the French astronomer Pierre Jansen, both observed peculiar yellow spectral lines around the sun that could not be replicated with known elements. The confirmation of helium on Earth did not occur until more than twenty years later, making it the only element discovered extra-terrestrially before being identified on Earth. What is VY Canis Majoris?